MINNEAPOLIS, MINN. - Thirty months after suffering a head injury in Iraq, Catholic priest Rev. H. Timothy Vakoc of Theta-Rho Chapter (St. Cloud State University) -- so seriously wounded that doctors at first thought he wouldn't survive -- is now talking. "Be quiet, don't say anything and be patient," a friend on the other end of the line told her. Puzzled, Vakoc waited. And then she heard her son's voice. The Rev. Vakoc, a Catholic priest, has started to speak, to the astonished delight of family, friends and caretakers. So far, it's only a few words at a time, and a struggle at that. But medical experts call it a significant breakthrough. "Nobody ever expected him to live. Nobody ever expected this to happen," said his sister, Anita Brand. Their faith, though, helped sustain the whole family. "I have always held out hope." Frater Vakoc (pronounced VAH-kitch), 46, has spent most of the last two years at the Minneapolis Veterans Medical Center in what doctors call a "minimally responsive" state. He needs round-the-clock care, and he can't move much more than his left arm, hands, and a few muscles in his face and neck. 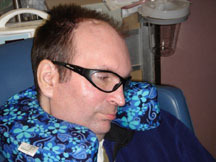 In recent months, family, friends and hospital staff saw signs, often subtle, that he was becoming increasingly alert. But he had not spoken since the explosion. No one could be certain how much of his mental function was still intact. Over the last several weeks Father Tim's family and friends have noticed small changes in Father Tim. He appears more alert for longer periods of time. He smiles more and laughs more...and that mischievous twinkle is often there. Problem solving, although still inconsistent, seems to be coming easier but very slowly. Although he tires easily and still snoozes through visits, when he is alert, Father Tim seems more determined than ever to interact with his visitors. He has become more proficient with his Dynavox -- still an important tool for his communication. During the last week the family was stunned when Father Tim began to speak. Although somewhat labored and halting, his words thrilled them all. Simple words like "Hi" and "I love you" were music to the ears of his family members especially his parents. Some of his first words were halting phrases of the "Our Father." Clearly, it is a joy to hear his voice after two and a half years. The last two years have been a journey of prayer and petition, faith and faltering, love and languishing. During the long 30 months, Father Tim's family has never given up hope that one day they would again hear his voice. Myriad caregivers, beginning on the roadside in Mosul, Iraq, continuing in Walter Reed Army Medical Center, and then at the Veteran's Medical Center of Minneapolis, have all worked for the day when they could again hear him speak. Whether part of the medical team or volunteers from local parishes, their goal is a common one: help Father Tim recover, support his family, pray for his Soldiers and their families. To read more about Fr. Tim's journey, please follow the web link listed here. The Minnesota Star Tribune newspaper has written an article about Fr. Tim and the progress he has recently made. Fully aware that there is a long road ahead, with humble and grateful hearts they accept this gift of encouragement. Adapted from Minnesota Star Tribune Article and Caring Bridge Patient Page. If you would like to see your chapter news here, contact Communications Coordinator Tom McAninch.